Rumanian town in the province of Dobrudja. During the Russo-Turkish campaign of 1828 some Jewish purveyors came with the Russian army to Constanza, and, settling in the place, formed the nucleus, of a small community. A separate community was founded later by some members of the Sephardic (Spagnioli) communities of Asia Minor. In 1853, during the Russo-Turkish campaign, the community was further increased, and a cemetery was laid out. Sir Moses Montefiore, visiting Constanza on his journey to Jerusalem in 1868, gave £200 to the president, Ilie Avram, for the purpose of building a synagogue. 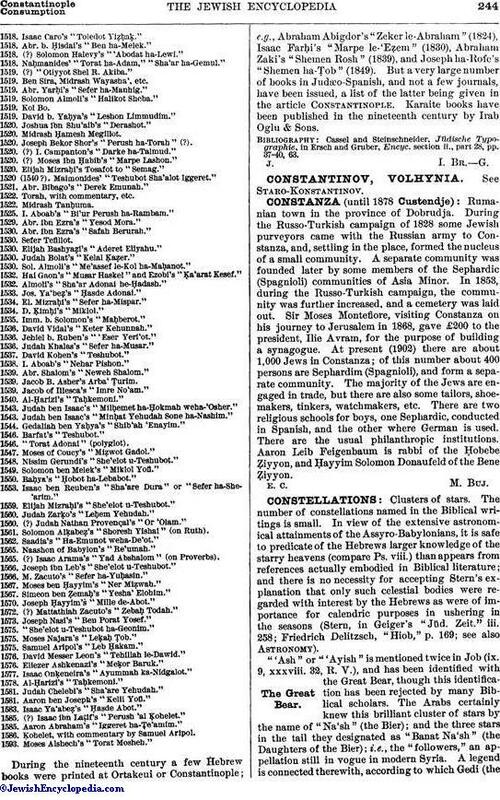 At present (1902) there are about 1,000 Jews in Constanza; of this number about 400 persons are Sephardim (Spagnioli), and form a separate community. The majority of the Jews are engaged in trade, but there are also some tailors, shoemakers, tinkers, watchmakers, etc. There are two religious schools for boys, one Sephardic, conducted in Spanish, and the other where German is used. There are the usual philanthropic institutions. Aaron Leib Feigenbaum is rabbi of the Ḥobebe Ẓiyyon, and Ḥayyim Solomon Donaufeld of the Bene Ẓiyyon.